To achieve the Paris targets, the installed solar capacity we’re going to need by 2030 is estimated as being in the range 8-10 TW nominal; this would require 22-25% annual growth rate in manufacturing capacity. MIT’s Tonio Buonassisi presented the results of some detailed economic and technological modelling to test the plausibility of achieving this more than a hundred-fold increase (details in this paper – PDF). He estimates that current manufacturing capacity is sufficient to achieve 1 TW by 2030, and that currently foreseeable technological improvements could increase this to a little more than 3 TW. But to achieve more than this will need new technology. The two priorities for improvement need to be to reduce the capital expense of the manufacturing plant, and to increase the efficiencies of the solar cells that are produced. The best single crystal solar cells can now achieve an efficiency in excess of 24%. This is still less than the theoretical maximum, which is around 29%, set by the so-called Shockley–Queisser limit. This arises because solar energy arrives in the form of photons of different energies – i.e. as a mixture of different coloured light – while a simple solar cell works best for photons of one energy. The key parameter is the band-gap of the semiconductor – that is, the minimum energy you need to give an electron to promote it to an excited state, resulting in an electron-hole pair that causes a current to flow. If the photon has a lower energy than the band-gap, it won’t be absorbed, so its energy can’t be captured. But if a photon has an energy much greater than the band-gap, then it is absorbed, but any energy it has in excess of the band-gap is lost. How can we get the efficiency of silicon solar cells – and those of other materials – closer to the Shockley–Queisser limit? That issue was addressed by Albert Polman, from AMOLF in the Netherlands. His analysis separates out the limiting processes preventing cells from achieving the theoretical limit. Broadly speaking, cells can be limited by failing to collect and capture all the incident light – poor light handling – or by failing to collect all the electrical charges created by the light – poor carrier handling. His work has concentrated on improving the light handling in silicon solar cells through the introduction of resonant light scatterers which capture the light and redirect it into waveguide modes in the cell, increasing the chances that it’s absorbed and converted into electricity. The other approach to the problem seeks to exceed the Shockley–Queisser limit entirely by using a series of different absorbing materials, each of which is optimised for a different wavelength. These so-called tandem cells can be thought of as a series of solar cells stacked on top of one another, so the top one absorbs the blue light and the lower ones successively absorb the light at longer wavelengths. The current world record for solar cell efficiency – 46.1% – is held by such a cell. Frank Dimroth, from the Fraunhofer Institute for Solar Energy Systems in Germany, which designed this cell, explained the manufacturing innovation that has made it feasible to install this kind of solar cell at scale, in a 44 MWp installation in South Africa. These cells are based on multilayers of different types of III/V semiconductors; in previous iterations of the technology the need for precise atomic-scale matching at the interfaces resulted in costs quoted by another speaker of around $40,000 a square meter. The new Fraunhofer ISE technology bonds layers together through a very thin amorphised layer, radically reducing this cost. The cost per unit area still remains very much higher than silicon, however, so these cells are used with solar concentrators – lens systems that focus light from a larger area onto small cells, concentrating the light by a factor of more than 300. These focusing systems need to track the sun as it moves across the sky, so that necessarily adds further cost. If III/V semiconductor solar cells represent the high road to solar power, through high efficiency cells engineered with exquisite precision, the low road is represented by the promise of ultra-cheap solar cells, perhaps with lower efficiencies, manufactured at very large scale by printing processes. This has been the promise of organic and polymer based photovoltaics, and as Imperial College’s Jenny Nelson explained, there has been considerable progress in optimising these materials for solar harvesting, both through manipulating the electronic properties of these molecules through their chemistry, and through creating different microstructures in polymer blend films. But I think it is fair to say that organic and polymer photovoltaics have been eclipsed by two factors. The first is simply the rapidity with which costs have fallen for conventional silicon solar cells, and the second is the unexpected discovery of an entirely new class of solar cells that also can be made with simple and potentially cheap solution processed technologies. This are the new perovskite solar cells, discovered by Oxford University’s Henry Snaith. Snaith recounted the history of these solar cells, based on compounds consisting of lead halides complexed with organo-lead compounds to form a perovskite crystal structure. These compounds were discovered as long ago as 1892, but they were first used in a solar cell by the Japanese scientists Akihiro Kojima and Tsutomu Miyasaka in 2009. They used the material as a sensitiser in another type of solar cell – the dye sensitised nanotitania cell invented by EPFL’s Michael Graetzel. In this kind of cell, the perovskite absorbs light, but the electrical charges are conducted away by titanium dioxide and an electrolyte. Snaith’s discovery, in 2012, was that you could use the perovskite to conduct charge as well, and with this insight his group had, within a year, made a perovskite solar cell with 15% efficiency. There are still barriers to the wide uptake of perovskite solar cells – their stability is still an issue, with the methylammonium cation prone to disappear (for the same reason that smelling salts smell of ammonia). Snaith’s company, OxfordPV, is driving their commercialisation aggressively – with another funding round a few weeks ago, it has now raised more than £21m and is moving to pilot scale. Interestingly, OxfordPV’s emphasis is not, now, on making an all-perovskite cell – it is on creating a tandem cell with perovskite on silicon, to take advantage of the massive technology base underpinning silicon solar cells, while using the technology to give it an efficiency boost – Snaith believes that a 32% efficient cell is possible with incremental improvements from the current state of the art. Later, an all-perovskite tandem cell with even higher efficiency, but lower cost than the III-V tandems, may be possible. What the remarkable story of perovskite solar cells should teach us, though, is that there is still the potential for surprises and new discoveries in this field. For clues as to where to find these new discoveries, it might be worth looking to biology, where photosynthesis represents a remarkably effective method of harvesting solar energy, optimised by billions of years of evolution. Greg Engel, of the University of Chicago, has some sophisticated new techniques to study how these biological systems transport energy using quantum mechanical principles. This is in spite of the highly fluctuating environment in which the light absorbing units operate – these chromophores are held very precisely in place by the protein molecules of the light harvesting complex, but these remain very dynamic environments. The insights from this kind of work may well lead to new concepts for solar energy harvesting, particularly in the area of solar fuels, where solar energy is converted directly into oil substitutes. World energy consumption since 1990, plotted on a log scale on a primary energy equivalent basis (i.e. 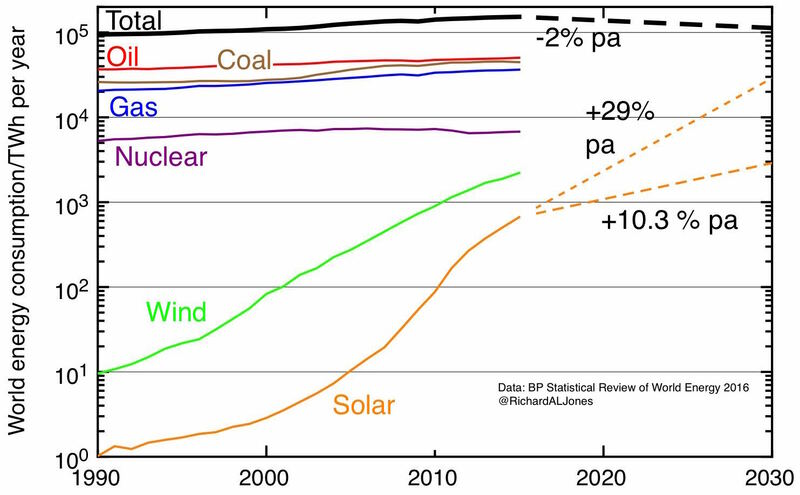 solar, wind and nuclear plotted in terms of the amount of fossil fuel used for electricity generation they would displace). Projections for future growth in solar energy follow two scenarios – +10.3% growth per year, which would be achievable with the existing manufacturing infrastructure and would produce an installed capacity of 1 TWp by 2030, and 29% pa, which is what is required to achieve an installed capacity of 10 TWp by 2030. Data from the 2016 BP Statistical Review of World Energy. So, where are we now with solar energy? My graph of world energy consumption shows both the reasons for optimism – the more than 6-fold growth of solar energy in the five years to 2015 – and the reasons for realism – that even after this spectacular growth, solar still only accounts for 0.5% of the total energy consumed as fossil fuels. How might the future unfold? I’ve sketched two projections, which, I think, roughly bound the range of likely outcomes. The pessimistic projection, of a bit more than 10% growth a year, roughly represents Tonio Buonassisi’s view of what the current solar manufacturing capacity can deliver up till 2030. The result is more than a three-fold increase: good, but still only representing a few percent of energy use, nowhere close to making a material impact on our overall fossil fuel consumption. The optimistic projection projects 29% growth; if this were combined with improvements in energy efficiency, which reduced overall energy consumption by 2% a year, this would lead to solar accounting for nearly 20% of world energy use. This would be far from rendering fossil fuels obsolete, but would be a useful step to decarbonisation of energy by mid-century. But, Buonassisi’s analysis emphasises that this will not happen with today’s technology. I think the politics is challenging, too. We do have the Paris agreement – but even leaving aside the threat to this from a Trump administration, my fear is that the politicians do not know the scale of what they have signed up to – an energy transition of unprecedented speed and scale. The danger is of willing the ends, but not the means. We know that economic dislocations on this scale will produce losers as well as winners, and those losers are not without political power. In the current state of world politics, I don’t think we can rely on internationally agreed policy interventions such as carbon prices, or other ways of costing the externalities of fossil fuels or subsidising renewables, to drive this transition. Instead, we have to drive down the cost of renewables to make them as competitive as possible with fossil fuels without subsidy – this applies to nuclear energy, too, and to the problems of energy storage which will themselves become a limiting factor on the uptake of renewables. This will take innovation and energy R&D – probably with as much or more attention given to the D as the R. Solar energy is now a high volume, low margin commodity business, brutally competitive and prone to problems matching supply and demand as capacity is ramped up, so it isn’t obvious that the private sector is going to be able to deliver this. The new science developments in solar energy harvesting are cause for optimism, but we need to be clear about the scale of the problem we face in developing and scaling up these new technologies and make sure we have the will to deliver on the promise. Corrected 16 November: 70 GW of solar is the estimate for new capacity added in 2016 rather than total cumulative capacity, as originally stated. Thanks to commenter “M” for pointing this out. Hiya, just to say that there is more like 300GWp of PV in the world now, not 70GWp. Perhaps you were referring to the anticipated 70GWp of PV to be installed in 2016. Thanks, that may be the case, it was in the notes from the meeting so I may have misheard. I’ll check that. Buonassisi is wrong. Here’s why. If we take his model, and put ourselves in the shoes we wore 15 years ago, then we don’t get to where we have actually got to now. How do we explain this? Because he’s assumed that these companies have to be profitable. That seems like a reasonable assumption. Except it’s not how things have been so far. And he seems to have assumed that once a new generation of PV comes out, there is no further profitable market for older, more expensive PV. But PV isn’t only competing against itself, it can also take market share from coal, gas, nuclear. And now that PV is cheaper than those in a growing proportion of the world, that means there is a viable long-term market for today’s PV, even when its not the cheapest PV on the market, nor the most innovative. To put it another way, there are discontinuities in the demand curve that he doesn’t seem to have captured: once PV is the cheapest source of electricity for, let’s say, India, then Indian PV demand is going to rise to the point where PV is meeting as much daytime demand as possible. If I read your graph correctly, your optimistic projection is for about 30,000 Twh per year by 2030. Given that current electricity consumption is about 24,000 Twh per year that would mean complete solarisation of electricity supply, or a quick roll out of electrification of transport, heating and industrial processes by 2030. I think that is very optimistic. Seasonal storage of renewable electricity looks like an economic non starter, so the alternative is a global grid. I haven’t seen credible studies on a global grid. Maybe I’m just a pessimist, but when I see solar panels being installed in cloudy climates at capacity factors below 10%, I despair. The problem with perovskite and organic solutions is the problem of time! Solar at 18% – 24% efficiency is cheap enough and will be fine to save the world for there is plenty of space with deserts in China, USA, Australia, and especially Africa and Middle East. In fact at the best locations the price is less than 3cent kwh, cheap enough to bury Gas and Coal power. Northern Climates will get their power from Cheap Offshore wind which is also plentiful. Even the Right Wing Press is getting in on the act! Previous Previous post: Is nuclear power obsolete? Next Next post: What has science policy ever done for Barnsley?